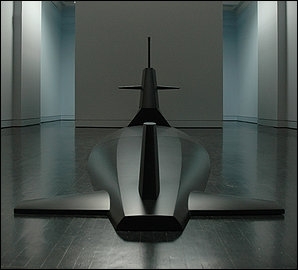 Collectively titled "Enigma," Dreyfuss's trio of abstracted, truncated models of submarines will subdue even the giddiest gallery-goer. Two of his matte-black forms sit on the ebony-stained gallery floor as if rising from an inky sea. A third surprises us from behind a partition, forcing itself into our physical and psychic space. As a group, the objects smack of surveillance, war and paranoia. With this trio, Dreyfuss seemingly alters the gallery's barometric pressure. The rooms feel nearly airless, as if the objects have created a vacuum. In the silence, we notice the churning of HVAC systems embedded behind gallery walls and sense a world lurking just out of sight. Yet the power of the show derives not simply from these disquieting forms. His objects also demand that we come to terms with the complicated circumstances of their making. And it's this grappling that gives Dreyfuss's works real impact. As is common practice in the art world, Dreyfuss chose to hire a fabricator rather than fashion these objects himself. Their precise curves and impeccable surfaces look machine-tooled, to be sure. What's striking is the company Dreyfuss chose -- a decidedly powerful beast called Alliant Techsystems. The firm claims to be America's largest supplier of commercial and military ammunition, a top manufacturer of satellite components and missile-defense systems, and counts the U.S. Army as its best customer. Headquartered in Minneapolis, ATK -- the company uses its New York Stock Exchange abbreviation to refer to itself -- employs about 18,000 people and anticipates fiscal 2010 revenues of more than $4.7 billion. Dreyfuss has a friend who works there, and a partnership ensued. To peruse ATK's online product catalogue is to enter the workaday world of high-tech weaponry. There's SLAM ("Selectable Lightweight Attack Munition"), designed for the Army and Special Operations Forces to be used against "enemy armored vehicles and other targets." SLAM's useful features include timed demolition and "operator-initiated command detonation with standard Army blasting caps or a time-delay firing device." Then there's ATK's "Spider," itself hardly itsy-bitsy. It "protects the warfighter by laying down either a lethal or non-lethal field of fire yet puts complete command and control in the hands of the soldier." Not the typical offerings at your local art store. Dreyfuss worked with the company's Mission Systems branch to fabricate the works in the show. For these ATK staffers, the Dreyfuss project offered a diversion from a typical day spent designing aerospace structures and the components of electronic warfare. And so, thanks to Dreyfuss, the art world enters the theater of war. ATK products have shown up not just in Kabul and Kandahar, but Logan Circle, too. For those of us who consider the term "military-industrial complex" to be a synonym for "bad guys," Dreyfuss has altered the definition. Here we experience the interconnectedness of technological innovation -- in art practice, munitions or aerospace -- as Dreyfuss muddies the space between Us and Them. It's a complicated equation. Though also manufactured by ATK, the Dreyfuss sculptures on view through January in the Katzen's concrete-walled moat -- it's called a "sculpture garden" -- have a different disposition entirely. Massive, white-painted totems, these objects are latter-day iterations of mid-20th-century abstraction. Like Tony Smith's massive boxes or Frank Stella's recent sculpture, they're macho and self-satisfied. The artist counts ancient tools as his inspiration. One of his elongated anvils is positioned inside the Katzen to clue us in on the project. Yet the large-scale, white-painted forms in the garden are so outsize that they seem to evoke totemic objects or Mesoamerican monuments. "Early I" stands 10 feet tall but is only about a foot wide; it's a tall sliver of a thing. It's markings are minimal: a circular depression about the size of a human head and a rivulet carved down its middle, lending an anthropomorphic aspect to the proceedings. Another object, "Cornwall," looks like an oversize nut -- as in hardware, not the edible kind -- that stretches eight feet across at its widest point. Dreyfuss's approach here seems that of the postmodern trickster, blowing up proportions and toying with scale. Here the already-dated strategies of heroic abstraction meet another set of overused visual cliches. The objects seem content to rest on these precedents rather than engage today's issues, something the "Enigma" works do so well.